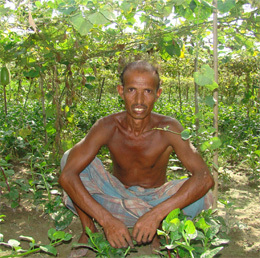 Mohammed Faruk is a farmer from the village of Mamurdhi in Kapasia in the district of Gazipur. He is about 35 years old and he has been a farmer all his life; he farms land which he mostly has inherited from his father and the rest he has bought by himself. His father used to be a businessman, who was able to buy a sizable amount of land that he left to his children. Faruk is not married and he lives in his own homestead with his mother, elder brother and his family. He farms mostly vegetables such as jali kumra, red spinach, sweet pumpkin, potato; he also farms jute as a cash crop. Besides this, he farms rice like most other farmers in his area. This entry was posted in Success Story on May 15, 2014 by Admin.